AQURON 2000 is a spray applied treatment for concrete curing, concrete waterproofing and durability enhancement for concrete structures. 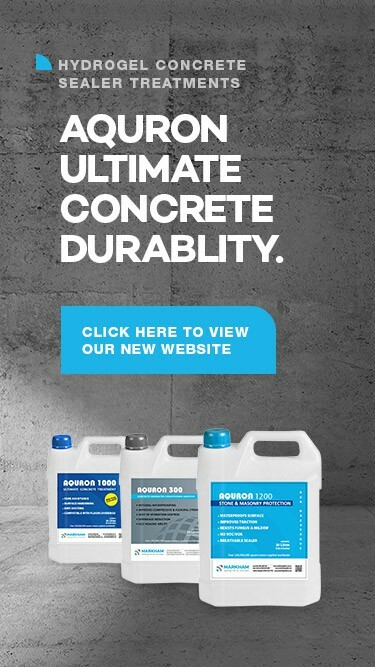 It can be used on both newly placed or existing concrete structures. This product is suitable and effective for concrete waterproofing on many structures including sealing basements, storage tanks, multi deck car parks, wharfs, infrastructure, processing plants, roof decks, bridges, commercial floor slabs and more. When newly poured concrete is treated with AQURON 2000 you will achieve a number of curing benefits such as maximising flexural and compressive strength but eliminating a number of curing problems that are associated with conventional curing methods such as high costs and difficult processes. Not only will you avoid these common problems, You will help to maximise flexural and compressive strengths whilst waterproofing at the same time. The AQURON 2000 spray on treatment works in a unique way by reacting with the internal free moisture and holding it in a hydro gel formation. This is superior to silicone based products. The gel is insoluble and seals to a depth of 150mm against both liquids and harmful gasses. AQURON 2000 treatment is also effective on existing and even very old concrete. Using this treatment adds significant durability enhancement and longevity to existing concrete by purging and immobilising contaminants and sealing the matrix internally to prevent further ingress and migration of debilitating liquids and vapour. AQURON 2000 can be used for concrete waterproofing to successfully stop leaks in structures such as multi level car parks, water tanks and basement floors.